You'll see some of the most iconic Golden Gate Park attractions on this 3 hour guided bike tour including the Conservatory of Flowers, deYoung Fine Arts Museum, the Academy of Sciences, the Painted Ladies Victorian houses , and the Presidio National Park. Experience San Francisco by bicycle! Feel the freedom, starting in Union Square area and easily go to the popular iconic sites, explore the Golden Gate Park, Haight/ Ashbury neighborhood, see the Ocean Beach and more! Bike tours of the best off-the-beaten-path spots. We love showing visitors our favorite spots. Let us guide you through the historic, quirky and popular places.We have a huge selection of new bikes. 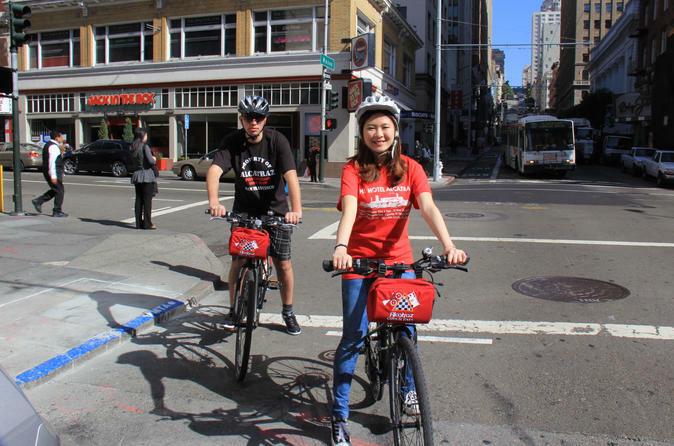 All bikes come with small bag, lock, helmet, bike map and great recommendations.Conveniently located in Post St. close to Union Square and in the Fisherman's Wharf and half a block from the Cable Car station.Biking provides the most freedom to experience San Francisco.